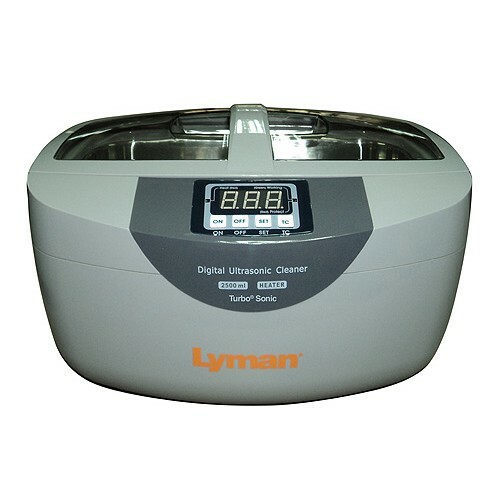 The Lyman Turbo Sonic 2500 Ultrasonic Case Cleaner delivers ultrasonic cleaning action that allows reloaders to clean cases inside and out in less than 10 minutes. The unit features a heated tank that when combined with Lyman's specially formulated case cleaning solution (sold separately) delivers superior case cleaning including removing residue from the inside of the case and primer pockets. Ultrasonic action creates "Microjets" that take off the most stubborn carbon from brass cases, gun parts and other equipment that will fit in the machine. Cases require dry time after cleaning prior to loading.